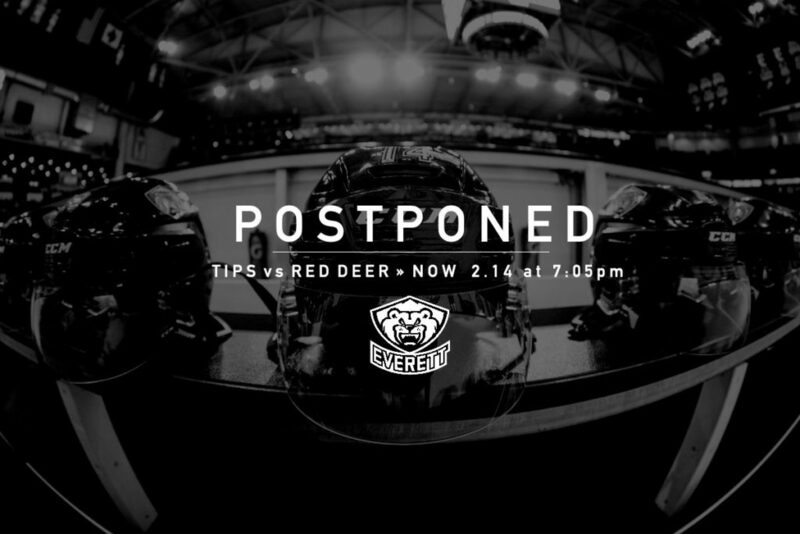 EVERETT, Wash. – The Everett Silvertips, in conjunction with the Western Hockey League, announced today that the Wednesday, Feb. 13 home game against the Red Deer Rebels, 7:05 p.m. at Angel of the Winds Arena, has been postponed due to inclement weather and travel conditions affecting the arrival of the Rebels into downtown Everett. The game has been re-scheduled to Thursday, Feb. 14, at Angel of the Winds Arena with the opening puck drop at 7:05 p.m.
All tickets and ticket vouchers for Wednesday night’s game will be honored for admission on Thursday night with doors opening at 6:00 p.m. Fans with tickets for Wednesday’s game, unable to attend Thursday night, may contact the Silvertips office at (425) 252-5100 (press “1”) for further ticketing options. Broadcast coverage will open at 6:40 p.m. on KRKO (1380 AM / 95.3 FM) / TuneIn app / WHL Live.